Communication between professionals can no longer be a sporadic, disjointed and unreliable chain of telephone calls, fax and letters in the mail. Canada's physicians, nurses and pharmacists are among the best in the world, but poor communication tools are hampering their ability to work together. Care continuity requires that message threads not be lost or forgotten. According to the Journal of the American Medical Association, with the move away from hospital-based care towards primary care, there is an increasing need for hospital-based physicians, specialists, and primary care physicians to communicate relevant patient information to one another and to follow up. Studies have shown that poor information translation and discontinuity of care are associated with lower quality follow-up care, higher risk of re-admissions, and adverse clinical outcomes. In a recent Health Canada survey of healthcare facilities, colleges and associations, 25 per cent cited communication and documentation errors as the main issues impacting patient safety or healthcare errors. A study from St Joseph's Healthcare in Hamilton to identify wait times for specialist referrals and barriers to getting timely appointments showed that up to 21 per cent of requests for consultation receive no response from specialists' offices. As stated in a white paper written on behalf of the Champlain, South East and Central East Local Health Integration Networks, it is estimated that between 25 per cent and 40 per cent of referrals may be avoided if primary care physicians and specialists have an effective means of communication to collaborate on patient cases. Allowing physicians to store communications electronically in the electronic medical records chart would reduce the need to store the same information in multiple locations and enable providers to access the patients' full medical history. Powerful communication can only happen when it is connected to the patient's medical record. This makes sure all physician communication is received in the full context of a patient's history, and a log of the communication becomes a part of the patient's chart. Care continuity requires that message threads not be lost or forgotten. The Canadian Institute for Health Information reports that 73 per cent of primary care physicians use electronic medical records to maintain patient clinical notes. This number is rising slowly but steadily. Some start-ups have made strides in enabling improvements. The Toronto and New York-based "Instagram for doctors," Figure 1, enables medical practitioners around the world to share images of patient ailments and seek the opinions of others. Its online mobile tool reached the one million mark in 2016 and medical images have been viewed more than 1.5 billion times on its platform. The MedDialog messaging service recently launched in Canada (by TELUS Health) is designed to support seamless information exchanges between healthcare providers directly from the patient's chart without any interruptions to the physicians' workflow. 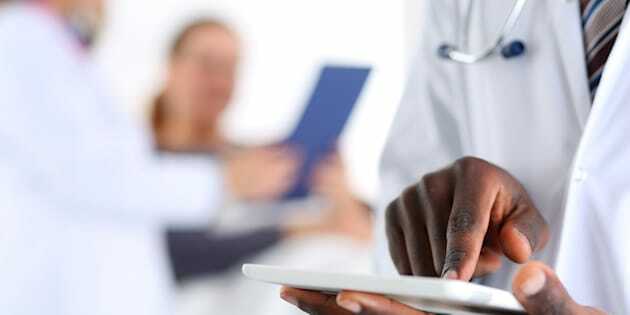 It lets physicians process referrals, eConsults and send messages electronically. No more reliance on paper, telephone or insecure channels such as email, texting and fax. When a secure way to connect and communicate with other physicians is enabled among the patient's care team, including primary care providers, specialists and the patients themselves, communications will no longer be a sporadic, disjointed and unreliable chain of telephone calls, fax and letters in the mail. It can help redefine Canada's healthcare system to one of truly integrated care that fully engages patients as partners in the care process.